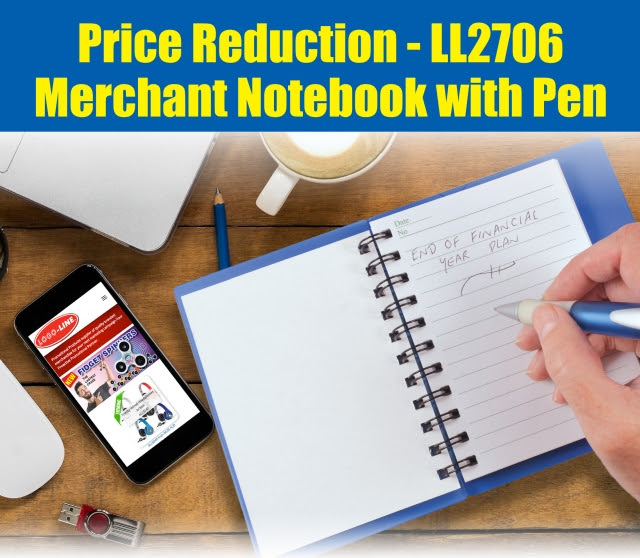 Your logo will look fantastic and highly visible on this Merchant Spiral Notebook with Pen. 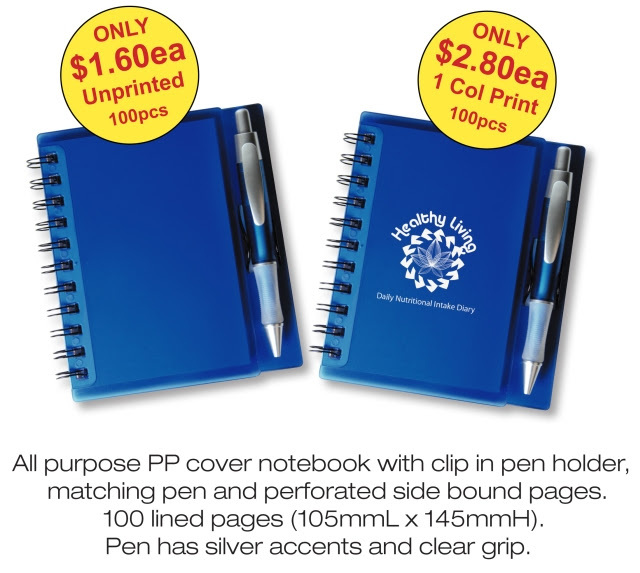 Featuring clip in holder for your pen and 100 pages of lined paper, this note-taking giveaway is all you need to promote your brand at conferences, seminars and education-related campaigns. Both the notebook cover and pen barrel are both available for imprinting. 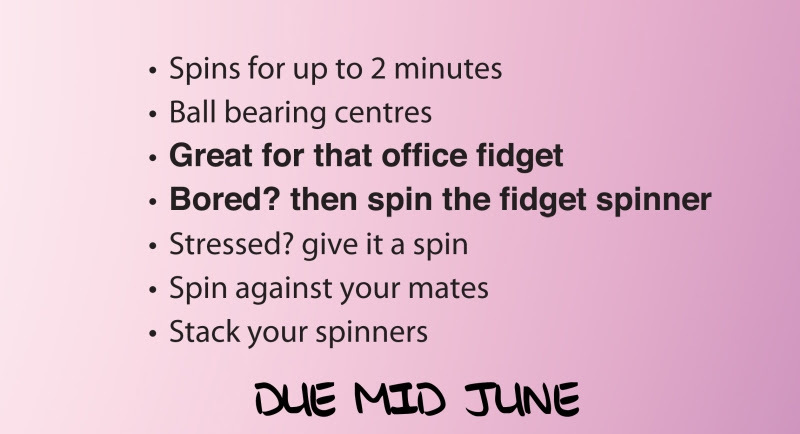 Cool New Promotional Fidget Spinners!! 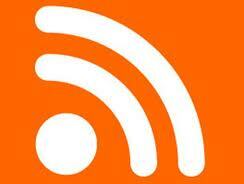 launches and promotions targeted at all ages, particularly millennials! Special on Aluminium Bottle Openers! Open up your brand to extra exposure at an affordable cost with this customised Aluminium Bottle Opener. This lightweight and practical keyring is great for holding keys and of course, opening bottles. Laser engraving & printing decoration options available, however this special only includes 1 position engraving on either Black & Blue. 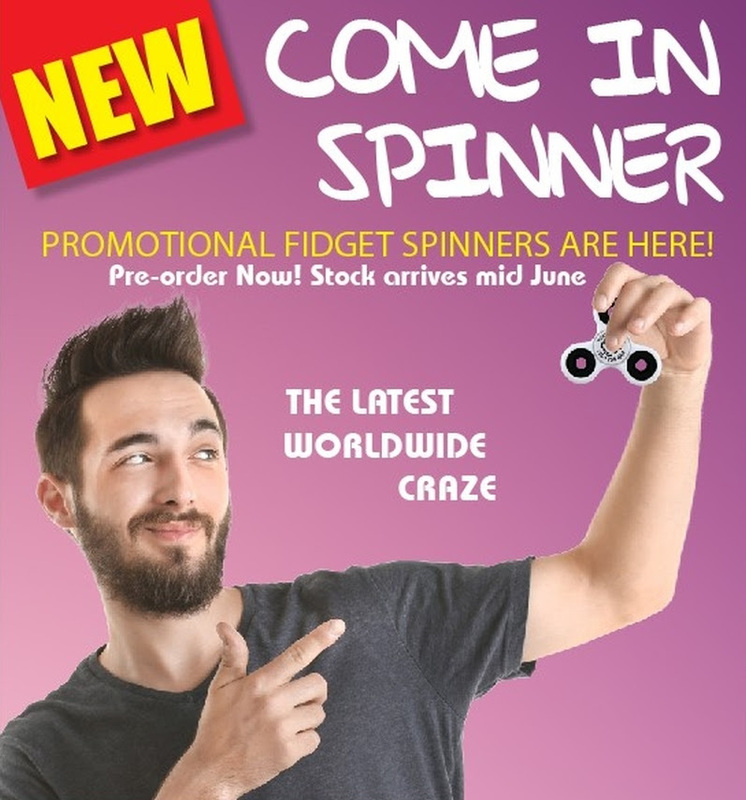 Charge up your promotional efforts with a handy giveaway your target market will always use. 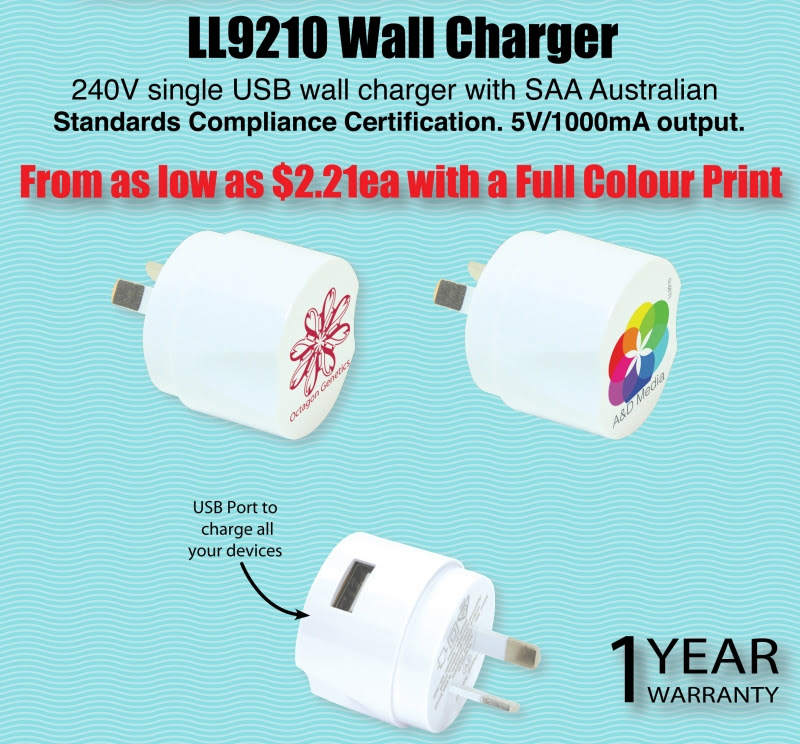 Perfect for single charging, this personalised Wall Charger 240V is ready to use. 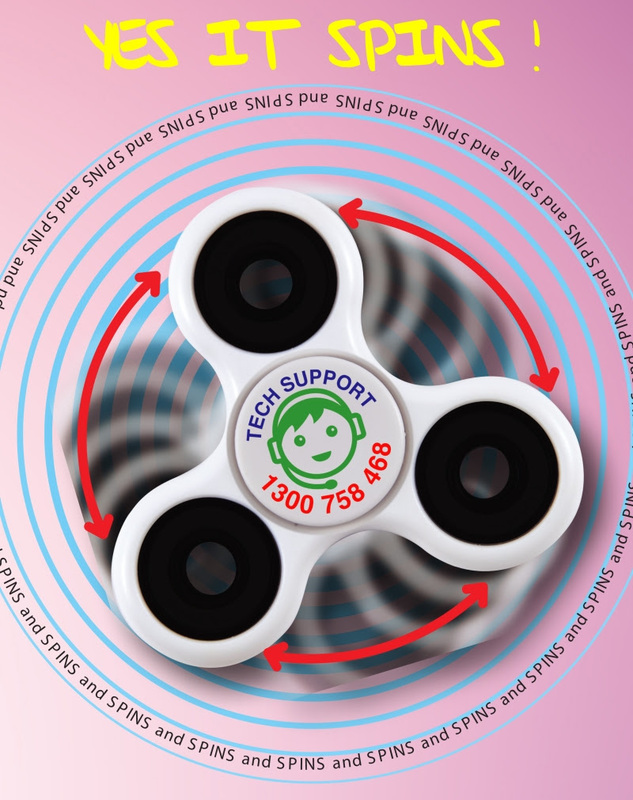 It is SAA Australian Standards Compliance Certified with 5V/1000mA output. Present with your logo pad printed on the charger and on the optional EVA case for extra brand exposure. With this imprinted Ranger Sports Bag, you can haul everything you need without problems. Made from 600D polyester fabric with three contrasting panels and studded base for durability, this trendy sports bag is perfect for sporting events, outdoor campaigns and travel promotions. The Ranger Sports Bag features a U-shaped opening to main compartment, zippered end compartments, front zippered compartment and adjustable webbing shoulder strap. 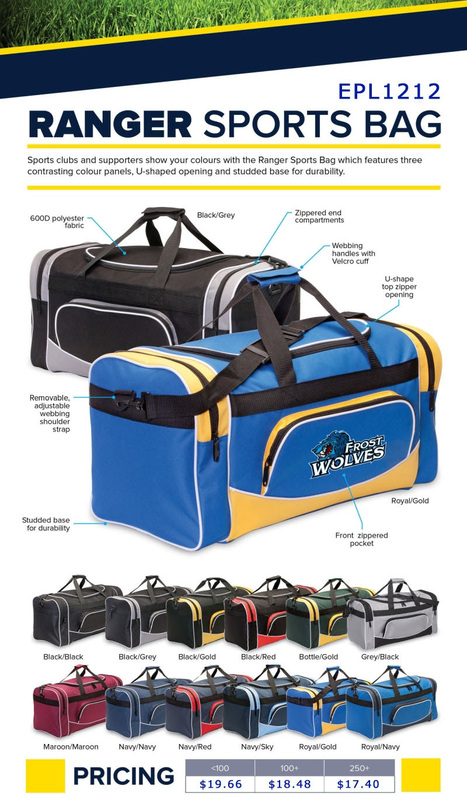 Have this sports bag screen print or embroidered with your logo for maximum impact. Offer customers a no-fuss giveaway they'll love to carry on sports tours and other travels with this personalised Mascot Sports Bag. 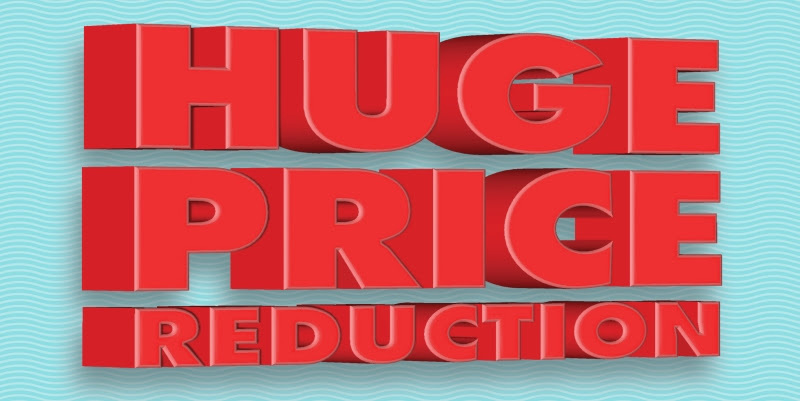 Available in a range of trendy colours, this promotional bag is sure to be a stand out. With plenty of space to haul the essentials, the Mascot Sports Bag features a U-shaped opening to main compartment, zippered end compartments and front zippered compartment for added space. The sports bag has two carry options including an adjustable webbing shoulder strap and webbing handles with velcro cuff. 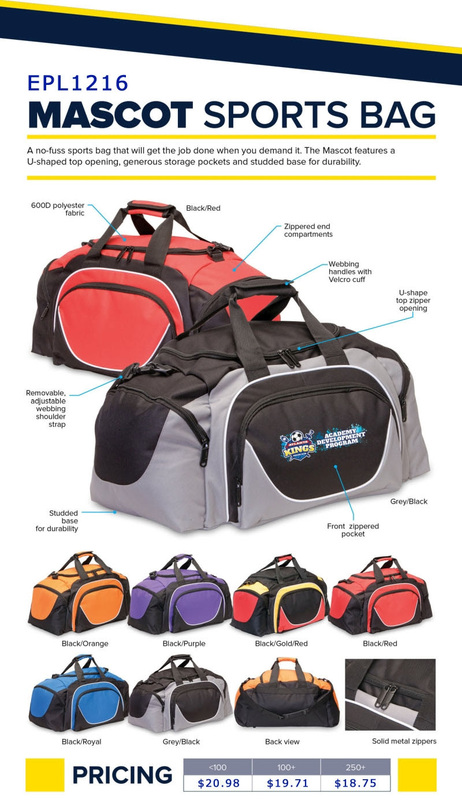 For durability, the Mascot Sports Bag has a baseboard and studded base.